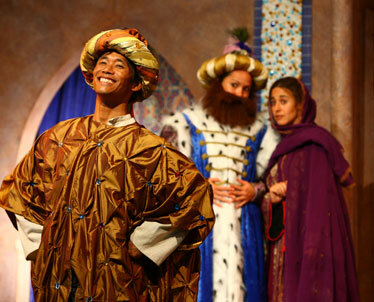 Junior Tesoro stars in the Honolulu Theater for Youth production of "Aladdin's Luck." Time was when kids got three full months of summer vacation, and Honolulu theater reviewers and Po'okela Award adjudicators got at least a few weeks off between the end of one theater season and the start of the next. Place: Kumu Kahua Theatre, 46 Merchant St.
Not so anymore, for this season, at least: Honolulu's 2008-2009 season started almost a month ago, while the 2007-2008 season was still in progress. And the tempo is accelerating with three more productions opening within the week. First comes the Hawaii Shakespeare Festival production of "The Merchant of Venice," which opens Friday for a two-weekend run at The ARTS @ Marks Garage. Scholars disagree on whether Shakespeare wrote the play's famous villain, a Jewish moneylender named Shylock, simply as one of the stock anti-Semitic characters popular in Elizabethan fiction, or if Shylock's show-stopping "If you prick us, do we not bleed ..." speech was intended as a subtle antidote to prejudice. NO SUCH controversy surrounds Honolulu Theatre for Youth's season-opening production of "Aladdin's Luck," which also opens Friday night. HTY company actor Junior Tesoro stars as Aladdin in a story loosely based on the classic Arabian folk tale and the blockbuster Disney film. Expect a sugar-coated message for kids age 4 and up about honesty and friendship being more important than owning neat stuff like a magic lamp or flying carpet. KUMU KAHUA kicks off its season next Thursday with a revival production of "Da Mayah," local playwright Lee Cataluna's first play and, thus far, her best work. Eddy Gudoy is returning in the title role he originated back in 1998, but his leading lady, "Sista Sherry" Clifton of KRTR 96, who stole the show as "queen-sized princess" Sandralene Ferreira in 1998, is not. Cataluna's plays typically rely heavily on topical local humor for their comic content, and word is that the script has been extensively rewritten to accommodate folks who wouldn't get her clever one-liner references to President Clinton, Milton Holt, Chris Hemmeter and "all 10 Sua brothers." Oh well. Anticipate a Po'okela Award-worthy performance by Gudoy nonetheless.